Six of us gathered on a hot and muggy afternoon in June to discuss this interesting novel. Among us there was a speech therapist, a social worker, a teacher, a dietician, a stay-at-home mom, and an editor, so we had quite a lot of experience with which to relate (or not) to the characters and story. WARNING: SPOILERS MIGHT APPEAR HERE! We all agreed that the main character, Victoria, was difficult to like, but that liking her was not a prerequisite for liking the book. The book’s main themes were forgiveness and second chances. We all thought the author’s use of alternating chapters to tell the story from both the current time and the past was effective. The story lines supported each other well and we did not feel as if we left hanging at the end of each chapter. Selena spoke about Victoria’s attachment disorder, which was a fascinating perspective considering how outraged we all were when reading how she left her infant alone. Viewing it from a psychological standpoint was very diverting. Would we have been as forgiving of Victoria as some of the characters in the novel? We thought not, which brought in some welcome comic relief. As for her action at the vineyard, we concluded that she was still a child and spite is not the same as meanness. One of our favorite parts of the book was the moment in the library when Victoria realized there was more than a single meaning for each flower. What a revelation, but also somewhat of a betrayal, that must have been for her! Janelle thought Victoria’s wedding flower business was a neat idea, and also thought it was nice that she employed other foster girls. One great comment was that Victoria’s character (and I think, the book in general) was more cognitive than emotional. I can’t agree more; although the interaction between the other characters was driven by trust, love, and forgiveness (or lack thereof), Victoria herself displays a distinct lack of emotions. That makes it very difficult to relate to her, which turns us off as readers. Another thought, this time from China, was that the backstory itself was compelling and that several individual stories would have been interesting on their own. That especially included the early rivalry between Elizabeth and her sister. Overall, our votes averaged a 3 out of 5 for this novel. Not a favorite but interesting enough to warrant a great discussion. I really enjoyed that book. I agree wih what you all say about Victoria but at the difference, I did feel sorry for her regarding the fact that she has a problem with others : both to accept them and she thinks, to be accepted. 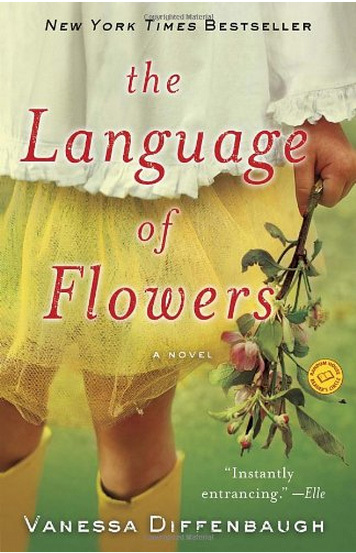 I thought the idea of communicating with flower was very poetic and was so much in the book at some point, I didn’t want to put it down. Thank you for the nice comment, mesetageresenfranglais! I thought a lot about this book afterward, wondering about the characters and their motives. Maybe the author will write a prequel or sequel to explain some of them!